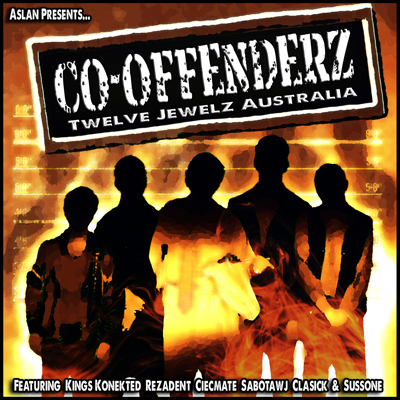 Aslan Presentz… Co-Offenderz Twelve Jewelz A.U.S. Founder of Twelve Jewelz Productions and The Horns of Jericho Soundsystem. UK based Emcee/Producer Aslan has been creating music & performing for well over a decade at home and abroad cementing himself as both an innovative lyricist and solid beat maker. Heavily influenced by the sounds he heard growing up when he would borrow his parents vinyls/cassetes which he descibes as “…a mix of everything from reggae, classic soul, rnb and motown to rock, house, dub, and early hipn hop”. By age 10 he started to build his own collection of music, the 1st CD being Ice Cubes “Amerikkkas Most Wanted”, he further explains “I was captivated by the lyrical content in the music I was hearing at that time, it spoke many of my thoughts an feelings, thats what drew me in more than just the artform itself and the wordplay, fasion etc, much of the hiphop around at that time still had a very conscious old skool element to it but had more appeal to the streets”. Aslan has been busy building with his Twelve Jewelz family around the globe and is set to present the follow ups to The Concentration Camp Pt. 1 with The Latin Quarterz, French Legion, Twelve Jewels Australia, and The Horns Of Jericho compilations.